Beautiful Nauset Beach is just a mile away! This Listing Just Made Available for 2017! 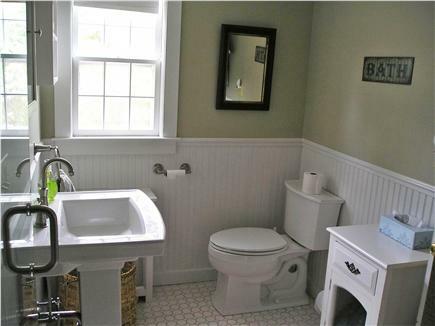 A beautiful new bathroom completes the charm of this comfortable cottage. 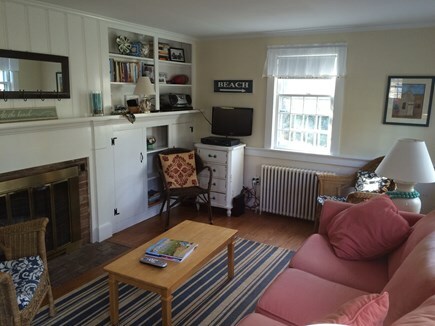 Whether you are looking for an active, fun and sun filled vacation, or simply a quiet getaway, this three bedroom cottage is a perfect launching point for you. 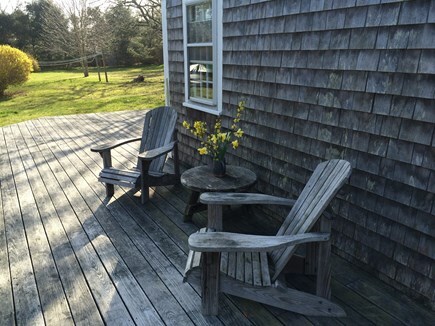 With 'peeks' of the water, it sits across the street from beautiful Meeting House Pond sunsets, and a little over a mile from the beach and waves of popular Nauset Beach. The large wrap around deck, complete with comfortable furniture and enclosed outdoor shower, overlooks nearly an acre of land (with lots of open space for whiffle ball and croquet!). It makes a wonderful spot to relax, read a book or share a meal. Inside, you will find cable and wifi and a welcoming feel. 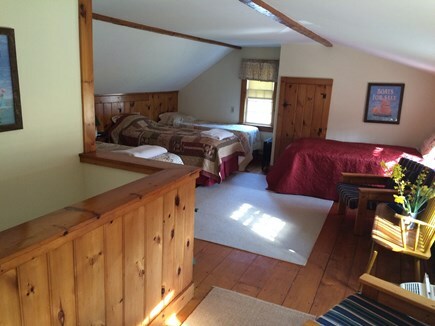 The upstairs bedroom is an open ''loft'' made charming with pine floors and beams, and is a favorite of children both for sleeping and playing. Just 1/4 mile to the center of East Orleans makes this location ideal! Of all the places I've traveled and lived, by far Cape Cod is my favorite. It holds a special place in my heart and the hearts of my extended family. Since the summer of 1975, I have been lucky enough to call East Orleans my summer home - but it truly is so much more than that to me.....it is peace, beauty, security, serenity - family, tradition, nostalgia. 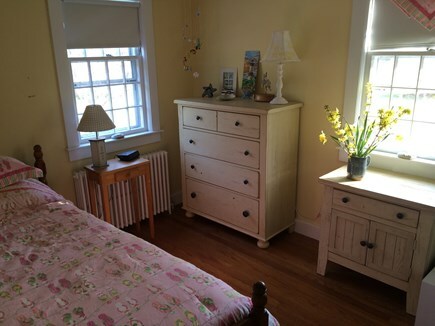 I hope our place helps you recall your fond memories if you have a history on the Cape, or create new ones if it is your first time here. 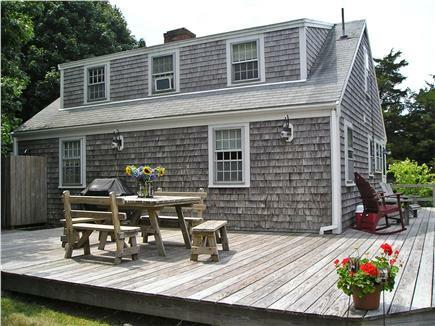 When I moved to the west and then midwest after graduating college, I immediately felt a pull to Cape Cod. 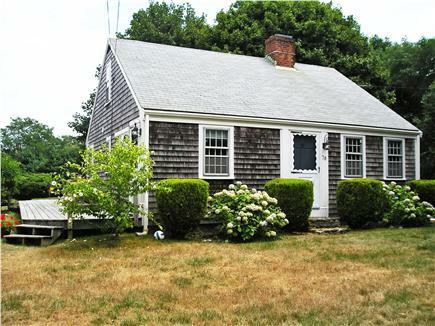 My professional aspirations didn't quite allow me to pursue work on the Cape, but they did allow me to make my first major purchase this home. 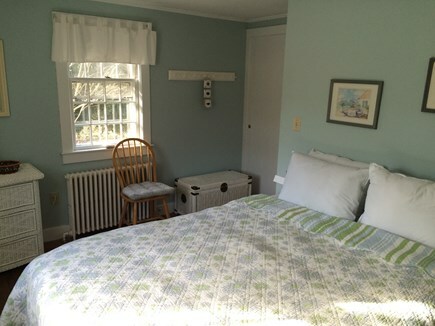 My husband and I have had this place since 1999 and have shared awesome times with our 3 children and very large families who also spend time on the Cape every summer. We have rented the house every summer since then, around our own time here. We still take up the biggest chunk of the summer calendar for our own use, but we love the families who have shared this space with their families. 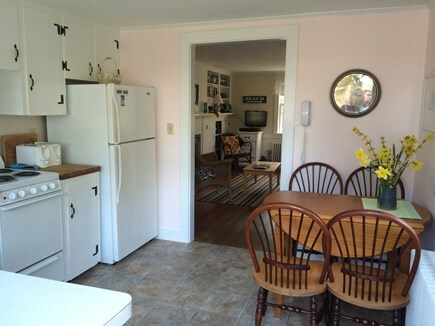 Our regular renters have been with us for years and years and treat our home like their own. We are very grateful for them and all the new families we ''meet'' each year! Our home sits on nearly an acre of land. Japanese Maple trees, Cedar trees, Maple trees, lilacs, hydrangea, roses and forsythia all come together to create a relaxing environment. Across the street is the beautiful town landing at Meetinghouse Pond - a salt water pond that feeds into Pleasant Bay and offers all the beauty you come to see on Cape Cod. Most of our guests love our outdoor shower under the canopy of Maple's that gives one of the most peaceful showering experiences they've ever had. The house is comfortable and easy to call home for a week (or 4.....). We love the simplicity of it. It has the amenities we need, but reminds us we are on vacation and for us that means creating a space that's more focused on the surrounding area - the places we want to go, the people we want to see, then on having to 'keep house' while there. Orleans is on the elbow of Cape Cod. It is home to many varying 'beach' options and activities. 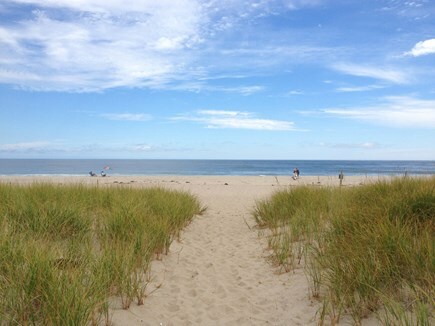 Nauset Beach is the popular ocean beach in town, with Skaket beach as the popular bay beach. Crystal Lake is a great fresh water option. Beautiful sunsets may be watched at Rock Harbor (or Skaket Beach) - and if you are ambitious, Nauset offers a lovely sunrise! Opportunities to do all the things you've heard about on Cape Cod exist in Orleans: Charter fishing (also surf casting, pond fishing), stand up paddleboarding, kayaking, sailing, surfing, swimming. There is yoga, sculling lessons on the town cove, night life, great restaurants, shopping, hiking, biking on the beautful bike trail - and the Orleans Firebirds of the famed Cape Cod wooden bat baseball league. Its an awesome launching point for all things Cape Cod - whether it be driving up to Provincetown for a whale watch or to Chatham to visit the Chatham Light - Orleans is pretty much in the center of it all.